Datalogic has announced the worldwide availability of the QuickScan QW2100 linear imager. Since its original limited availability release to some markets in early 2012, over several hundreds of thousands of QW2100 have been sold in less than 2 years. This product has been well received by the customers within these regions and offers a strong, mature foundation for this worldwide release. Datalogic believes in developing products that are based on various key points such as technological advancements, market trends, customer needs and the customer return on investments (ROI) requirements. Datalogic has over 40 years of experience in developing ADC products. Building upon its position as a leading pioneer of imaging technology, Datalogic continues to be in the forefront of linear and area imaging technologies for the corresponding markets. While there are specific market needs that may dictate the use of a laser bar code scanner, linear imager technology is able to offer multiple alternative 1D scanning options such as: solid state construction, which ensures no moving parts and less percentage of mechanical failures, ability to scan codes from mobile phones and computer screens, bright and more visible scan line, and an excellent price/performance ratio in the marketplace. In recognizing the varying market and investment needs of their customers, Datalogic offers a portfolio that spans multiple ADC linear imaging solutions. The QuickScan Lite QW2100 linear imager is a simple, small and ergonomically designed reader specifically designed for reading long and truncated bar codes found in various markets. This reader is a more affordable entry level data capture solution that offers a snappy performance on most 1D bar codes. It steps up to the challenge of capturing long and wide bar codes by its wide scan angle, laser-like thinner and extended scan line. It is perfect for use in retail, document/invoice processing and banking/finance environments. The QW2100 reader is a light weight and ergonomic unit that offers quick reading capabilities, available in either USB or Keyboard Wedge/RS232 interfaces. It features the Datalogic patented ‘Green Spot’ technology for good-read feedback seen directly on the code. The ongoing of the Green Spot, while the reader is in Stand Mode, enables the operator to correctly position the bar code for quick and intuitive reading. The stand specifically designed for the QW2100 imager is light in weight, collapsible to use as a holder versus a stand, and enables various settings by virtue of its ‘tiltable head’ function. This reader is built with over molded rubber to protect the imager when it may be dropped and it successfully passes drop resistance testing up to 1.5m/5.0ft. It has an IP42 water and particulate sealing rating and comes with a 3 year factory warranty. Most of the cables and power supplies used with the current QuickScan products may be used for the QW2100 imager. The available Datalogic Aladdin configuration software provides user-friendly features that simplify the start-up procedure and offers the ability to create custom configurations, even for the inexperienced operators. Various packaging options are available for the QW2100 imager, including scanner only, kits with the scanner, cable and stand, or the more environmentally friendly 10 count bulk packaging. 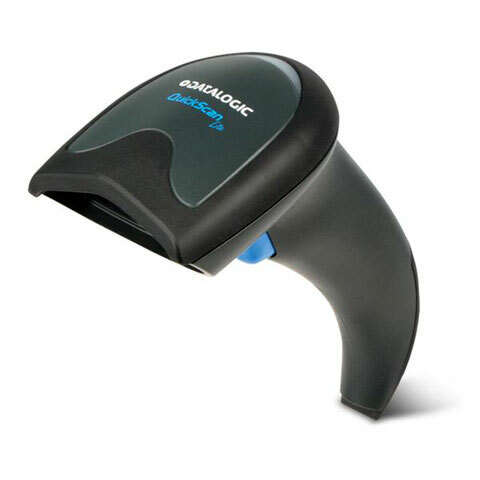 For more details or to order a Quickscan Qw2100, contact us at BarcodesInc.